Guessing, if you’ve read “A Tiger in the Kitchen,” is big in my family when it comes to cooking as well. Nothing is measured out — my Singaporean aunties have been known to slit open giant bags of sugar, hoist them over the wok and just start pouring when making pineapple jam. So I was prepared for Kelly’s recipe. Now, you can make this with or without pork or with chicken, tofu or beef instead. I intend to try as many of those combinations as I can. As for Kelly, thank you for this recipe, dear. I still hope to be you someday. Slice pork into french fry-sized pieces. In a wok, saute with a little oil (1 TB perhaps) and some salt until just done. Set aside. Add more oil to wok. Sprinkle rest of salt on oil and add ginger. After 20 seconds or so, add tomatoes. Mix and let cook uncovered for a few minutes. Add sugar. Drizzle beaten egg over tomatoes and let the egg set without stirring. 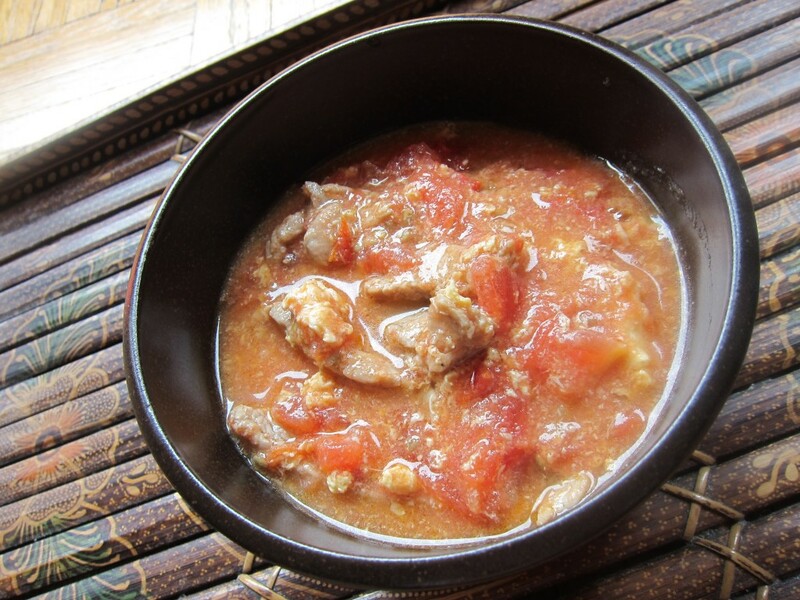 If using pork, mix it back into the tomato-egg combination.